Chiropractic Care - At Advanced Healthcare, we provide spinal and peripheral joint manipulative (adjustment) correction utilizing hands-on and other advanced "state-of-the-art" chiropractic techniques such as "activator". A chiropractic "adjustment" is a gentle force applied in a corrective manner to the spine (vertebrae) or affected extremity joint(s). This force is used to correct the motion in that vertebra or joint giving proper alignment and function to that area in the spine. This helps optimize biomechanics and relieve pressure from the nerves and freeing the nervous system... thus creating better overall health in the individual receiving the adjustment. The activator mechanical adjusting instrument is a very useful tool when we are treating broken ribs, the elderly or infant children. We can vary the impulse that the activator delivers. It is a nice option in many situations that we encounter throughout the day to help us deliver a patient's manipulation that we would not be able to do manually for one reason or another. Never in the history of chiropractic have we been able to provide the level of help and expertise that now exists. These newer correction methods are even safer, more comfortable and more effective than ever before. Dr. Pisarek has over 40 years of training and experience in painless, corrective spinal adjustment. Corrective Exercises - At Advanced Healthcare, we also teach our patients special "blueprint" exercises designed just for them to help strengthen and correct their own unique problem. These exercises can be performed in the comfort of your own home and can improve the effectiveness of your spinal correction by as much as 30-40%. In addition to skeletal misalignment, muscles and connective tissues can be out of place or strained by improper alignment and use. Specific exercises and stretches can help your body stay in balance and in health. Radiographs (x-rays) are an essential tool in the chiropractic office. A radiograph allows us to determine if a patient's condition is treatable in our office. We rule out fracture, tumors, etc., with the use of radiographs. This is important because our primary responsibility is to make sure that we are the proper treating provider because if we are not, we will refer the patient to a healthcare practitioner that can most appropriately serve their needs. Radiographs also show us postural alignment and degenerative changes that can help to assist us in treating the patient's condition more specifically, so that we can provide out patients the most effective care for long term recovery. Our modern radiology department offers the highest quality images at the lowest dosages. 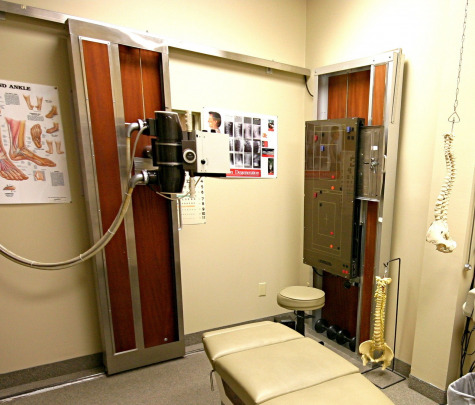 Our x-rays are taken standing so that we can assess your posture properly. We use all required shielding and protection for your safety.